This is a reprint of the "Ossetic language" article posted in Wikipedia and later revised to remove any material contradicting the Scytho-Iranian concept. Because of the vigilant editorial censorship by the proponents of the Scytho-Iranian concept makes the subject much devoid of the substance, the full uncensored text as of 29 July 2006 is posted for a record. Wikipedia materials are not copyrighted and can freely be used for educational purposes. In this posting, the irrelevant IE linguistic tables and Wikipedia formating were not preserved. To meet Wikipedia's quality standards, this article or section may require cleanup. Please discuss this issue on the talk page, or replace this tag with a more specific message. Editing help is available. This article has been tagged since June 2006. Ossetic or Ossetian (in Ossetic: Ирон ӕвзаг, Iron ævzag or Иронау, Ironau) is a language spoken in Ossetia, a region on the slopes of the Caucasus mountains on the borders of Russia and Georgia. The area in Russia is known as North Ossetia-Alania, while the area in Georgia is called South Ossetia. Ossetian speakers number about 500,000, 60 percent of whom live in Alania, and 15 percent in South Ossetia. Ossetian has a sizeable community of speakers in the Caucasus. It is an agglutinating type language with phonetics, morphology, lexicon, semantics and syntax belonging to the Kartvelian group of languages, but it is classed together with Iranian languages, of which it has less than 20%, or 800 word vocabulary (V.I.Abaev p.103). In contrast with Ossetian, the Iranian languages of the Caucasus Jewish refugees from Persia Tati and Persian settlers Talyshi are IE flexitive type languages. Indo-European classification of Ossetian enabled a Scytho-Iranian theory that it descended from Alanic, the language of the Alans, medieval tribes emerging from the earlier Sarmatians, and by extension to be the only surviving descendant of a Sarmatian language. Exploiting artificial linguistical classificaltions, Stalinist Russia conducted a sweeping action of ethnic cleansing, expelling entire nations from Caucasus and Crimea, widely dispersing them in its Asian possessions, and resettling instead "correct" nations and ethnically mixed populace that had to adopt Russian language as a Lingua Franca. The closest genetically related with agglutinating Ossetian language are Kartvellian languages, with which Ossetian is sharing phonetics, morphology, lexicon, semantics and syntax, but claimed to be the IE flexitive Yaghnobi language of Tajikistan, the only other living member of the Northeastern Iranian branch. There are two important dialects: Iron and Digor—the former being the more widely spoken. Written Ossetian may be immediately recognized by its use of the æ, a letter to be found in no other language using the Cyrillic alphabet. 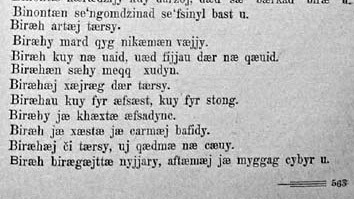 A third dialect of Ossetic, Jassic, was formerly spoken in Hungary. Linguistical dialectal division between Ossets is closely parallelled in their genetical composition. Three Ossetian dialects, Ironian, Digorian, and Ardonian, mirror three different genetic makeups. Ironians have male Y-haplogroup more similar to Georgians, the leading member of the Kartvelian linguistical group, than to Digorians. Digorians have male Y-haplogroup more similar to Adygs. Ironians have non-Iranian female mtDNA 81% to 88%, and share 12% to 19% of their mtDNA sequences with Iranian-speaking groups from Isfahan and Tehran. Digorians have female mtDNA of Adygean nations 48% to 87%, versus 12% to 19% of multi-ethnic Iranian samples. The closeness of the Digorian genes with the Adygs disspels a notion, precipitated by numerous Türkisms in the Digorian dialect, that Digorians are a Türkic tribe assimilated by the Ossetians. The Ossetians from Ardon are somewhat separated from Digorian groups, being closer to the of Caucasian and West Asian groups. A common origin of a fraction of Ossetian women from Persia, with male-mediated imprint of their Caucasian neighbors, is the most likely explanation for the genetical results. Also, Ossetians are about as distant from Iranian-speaking groups from Isfahan and Tehran, as from non-Indo-European speaking West Asian groups (Nasidze et al., "Genetic Evidence..."). The Ossetian verb system has a fully-developed agglutinating system of declination, a feature which is alien to all other Iranian languages. The well-developed agglutinating declination in each Ossetian case finds more or less exact typological equivalent in the declination of the Caucasian languages with the same semantical meaning and the same syntax function. Instead of flective Ancient Iranian (and respectively Indo-European) system of declination, the agglutinating declination of Ossetian is similar to the neighboring Caucasian languages of the Kartvelian and Eastern Mountaineer groups (V.I.Abaev p.99). About 50% of the Ossetian dictionary belongs to Caucasian languages. About 800 Ossetian words have more or less satisfactory Iranian or Indo-European matches. In percentage terms this figure is not great, as the number of bases in Ossetian is estimated minimally as 4000. About 20 % are elucidated Indo-European words. The number of loanwords from major Near Eastern Asian languages, Arabian, Persian, Turkic and Georgian also reaches 800 (20 %). Accepting for other non-Indo-European loanwords a figure of 400 (another 10 %), about 2000 remaining words belong to Caucasian languages (V.I.Abaev p.103). None of the dialects of the Ossetian language has a published Swadesh list or its analysis. In the semantics of the verbal prefixes (pre-verbs) the "Iranian" elements turn out to be filled with Caucasian languages contents (V.I.Abaev p.106). Ossetian declinations have identity of the syntax functions of Ossetian cases with the corresponding cases in the languages of the S. Caucasian (Georgian., Mengrel) and Eastern Mountaineer groups. 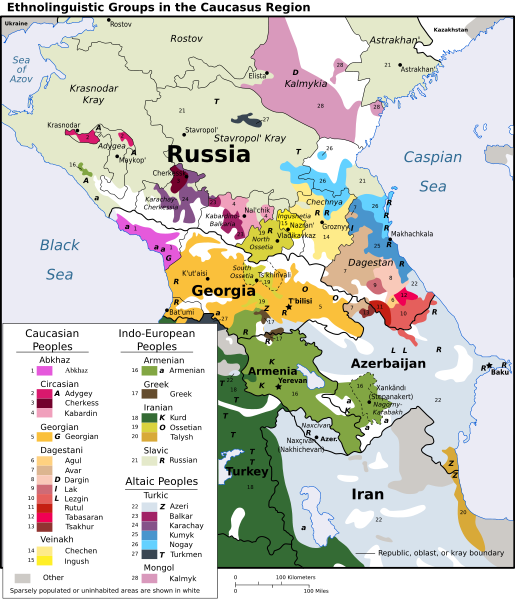 Ossetian, as southern and eastern Caucasus languages, instead of the Indo-European system of pretexts, has a system of postpositions which, usual for the Caucasian languages, demand a genitive case. Definition, however it is expressed, is always ahead of determined object; the reverse order is completely inconceivable, a similar syntaxis is in neighboring Caucasus languages, and in the languages of the Finnish and Türkic groups. Ossetian has a tendency to have predicate in the end, and also a tendency to place all words describing predicate (definitions etc.) ahead of the predicate, and all words, describing the subject (definitions etc.) in front of the subject, all this in even sharper and mandatory form belong to both eastern and western S. Caucasus languages. Adding such fact as twenty-based count, the Ossetian-Caucasian languages convergences grow into a whole system from which, as from a song, you cannot erase a word (V.I.Abaev p.108). The fact of the concurrence of the whole system of the Ossetian consonantism with the consonantism of the Caucasian group of languages is incomparably more important and instructive. Unlike Cyrillic, the Georgian alphabet is phonetically suitable for full and adequate presentation of the Ossetian sounds; using Georgian alphabet for the Ossetian books needs only three additional letters lacking in the Georgian alphabet (V.I.Abaev p.96). The literary form of the language has 35 phonemes—26 consonants, 7 vowels and 2 diphthongs. Among the consonants ejectives and uvular /q/ do not exist in the Iranic languages. Reportably, prior to the Russian conquest Ossetians were illiterate. After the Russian conquest Ossetians used Cyrillic script: the first Ossetic book being published in Cyrillic letters in 1798. At the same time Georgian script was used in some regions to the south of Caucasian mountains: in 1820 I.Yalguzidze published an ABC primer, modifying Georgian alphabet with 3 special characters. That Georgian-based script has been in use in the territory of South Ossetia (Georgian autonomy) in 1937-1954. The modern Cyrillic alphabet has been created by a Russian scientist of Finnish origin Andreas Sjögren in 1844: there were separate letters for each sound in that alphabet (much like in the modern Abkhaz alphabet). After a short use of Latin script (1923-1938) the Cyrillic alphabet (with digraphs introduced instead of most special symbols to facilitate printing) is in use till nowadays. Digraphs for representing one sound were used in the Roman alphabet too (ch, čh, th, dž and some others). The æ sound (IPA: [æ]) is extremely common in the language, a feature it shares with Persian. As such, it might also be transscribed in some texts as ă, like in Romanian. The first printed book in Ossetic appeared in 1798. The first newspaper — Iron Gazet — appeared on the 23 of July 1906 in Vladikavkaz. While Ossetic is the official language in both South and North Ossetia (along with the Russian), its official use is limited to publishing new laws in Ossetic newspapers. There are two daily newspapers in Ossetic: "Rastdzinad" (Рæстдзинад, "Truth") in the North and "Xurzarin" (Хурзæрин, "The Sun") in the South. Some smaller newspapers—such as district newspapers—use Ossetic for part of articles. There is a monthly magazine "Max dug" (Мах дуг, "Our era"), mostly devoted to contemporary Ossetic fiction and poetry. Ossetic is taught in secondary schools for all pupils. Native Ossetic speakers also take courses in Ossetic literature. Lora Arys-Djanaieva. Parlons Ossète . Paris: L'Harmattan, 2004, ISBN 2-7475-6235-2. Nasidze et al., Genetic Evidence Concerning the Origins of South and North Ossetians. Annals of Human Genetics 68 (6), 588-599(2004) .